Preheat oven to 425° – preheat baking pan with butter or grease. Sift dry ingredients together. Combine egg, milk and shortening together in a bowl then add dry ingredients. Stir until mixed completely. Pour into hot bread/stick pan/muffin pan/or small cast iron skillet. Bake until golden brown – about 20 minutes. Preheat oven to 350° – preheat baking pan with butter or grease. Sift dry ingredients together. Add buttermilk, well beaten egg and shortening. Stir until mixed completely. Pour into well greased hot bread/stick pan/muffin pan/or small cast iron skillet. Bake until golden brown – about 25 minutes. *Can be made with sweet milk but omit soda. Use the above recipe and simply split already cooked muffins – butter each side and toast in oven until delicately brown. Delicious for breakfast or other meals. LOve your products!! Medium corn meal is best I’ve ever found! I love your Alabama King cornmeal! So happy to find this. 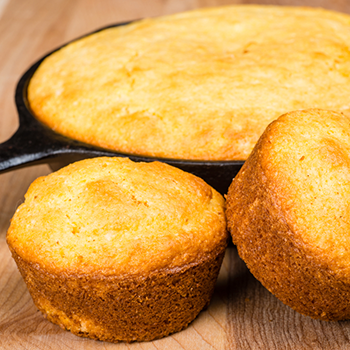 Makes cornbread and muffins even more delicious! Thanks! Thank you Amelia for sharing! We are glad that you enjoy it! Try the hoe cake recipe. You will love them!